Since turning the calendar a page, we have officially entered that lovely period in the year that brings endless cocktail parties with feasting and socializing overload. I happen to love this particular time of the year because it is an excuse to get together but with the added bonus of the “holiday” heading which means everyone wears sparkles and I get to eat my annual serving of gravy. The months of November and December are also the time where one needs a quick and easy little something to bring to that feast. I think written somewhere there is an official rule that you can’t show up to a party empty handed, right? A little jar of cocktail snack treats is just what you need to win the hearts of hostesses everywhere. I know it has been a little quiet ’round these parts but I’ve had a few too many failed dessert attempts emerge from my oven over the past week or so and I will admit that my baking mojo is low. 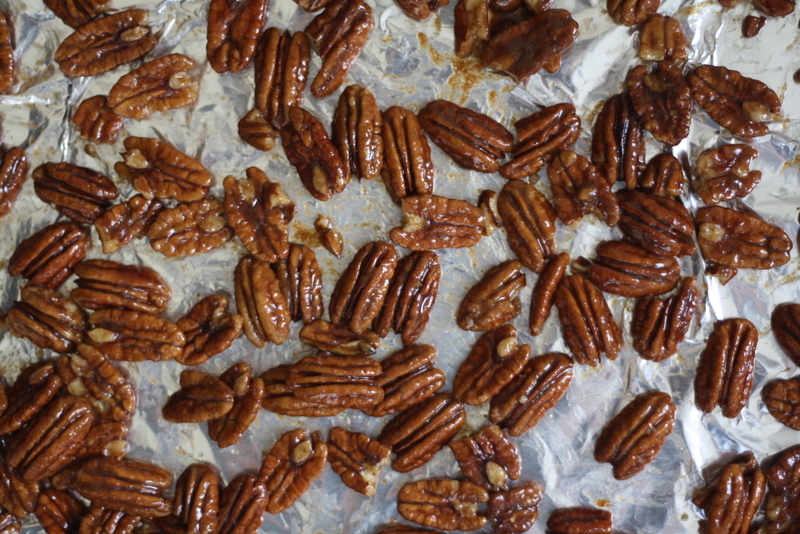 I needed to ease my way back into the saddle so hello there toasty pecans! 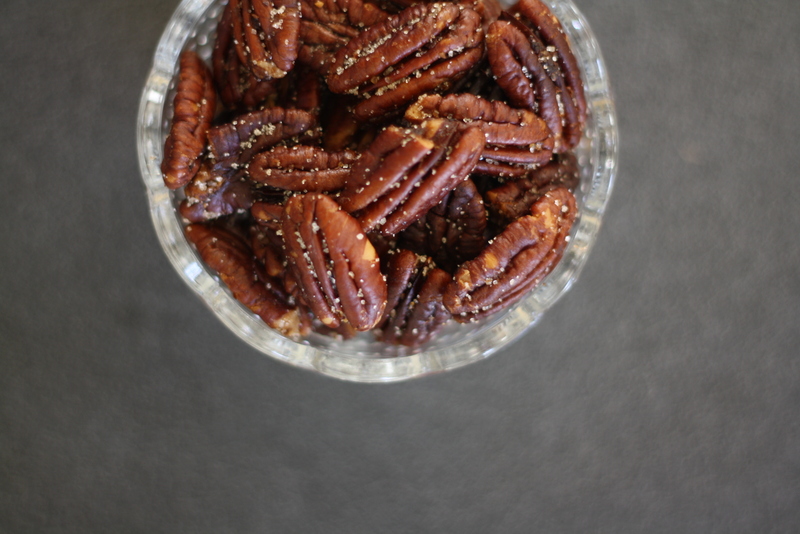 These bad boys are the sort of cocktail snack that your Grandma would make – that is – if your Grandma added espresso power for some major depth in flavor and a pinch of cayenne spice for a hint of heat. If this describes your Grandma, I would love to meet her and talk cocktail snacks. 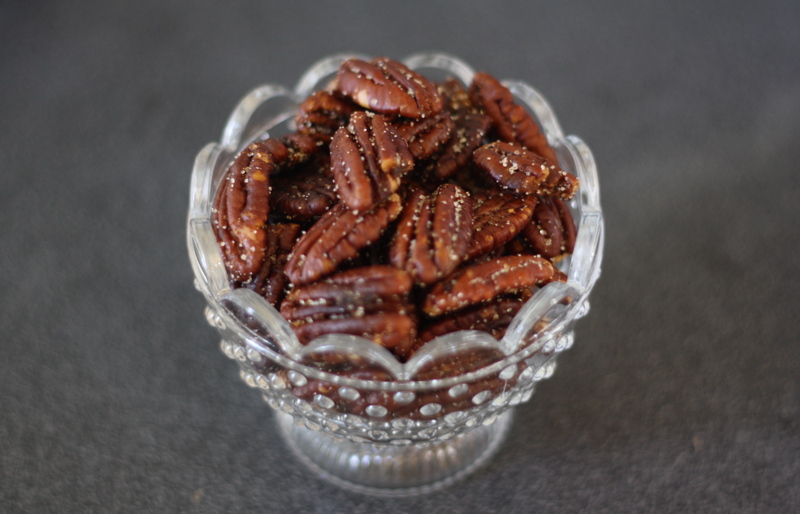 The added kicker is that these nuts are tossed in sugar when they are still warm from the oven so you get sweet and savory spice in every bite of toasty pecan goodness. I would recommend making a double batch of these buddies because you never know what invitation you will have to accept during these months and you sure don’t want to break the rules by showing up empty handed. Preheat oven to 300 and line a rimmed baking sheet with tinfoil. In a medium bowl stir together the melted butter, sugar, worcestershire, salt, cinnamon, espresso powder, cayenne, and ground mustard until combined. 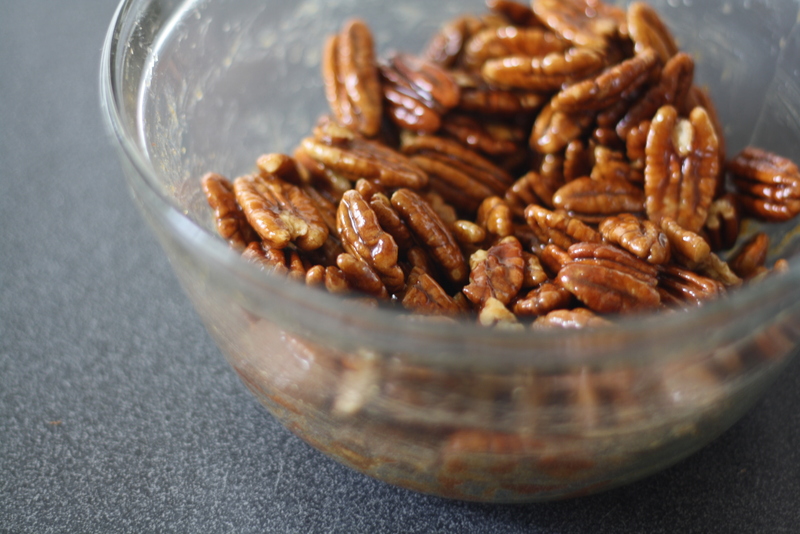 Add the pecans and use a spatula to toss them until the nuts are all evenly coated in the spiced butter mixture. Bake at 300 for 25 minutes, stirring several times as they cook, then increase the heat to 375 and bake for an additional 5-10 minutes or until toasty but keep a close eye on them and be careful not to let them burn. Transfer nuts to a medium bowl and toss with the additional teaspoon of sugar. Serve warm or transfer to an airtight container for several weeks. Note: The amount of spice listed in this recipe will yield a final pecan that one friend said tastes like “a pecan with spice, not an overload of spice that happens to be the coating on a pecan”. This, I love, as I prefer the pecan flavor to shine whilst enjoying a cocktail side-by-side with said snack. 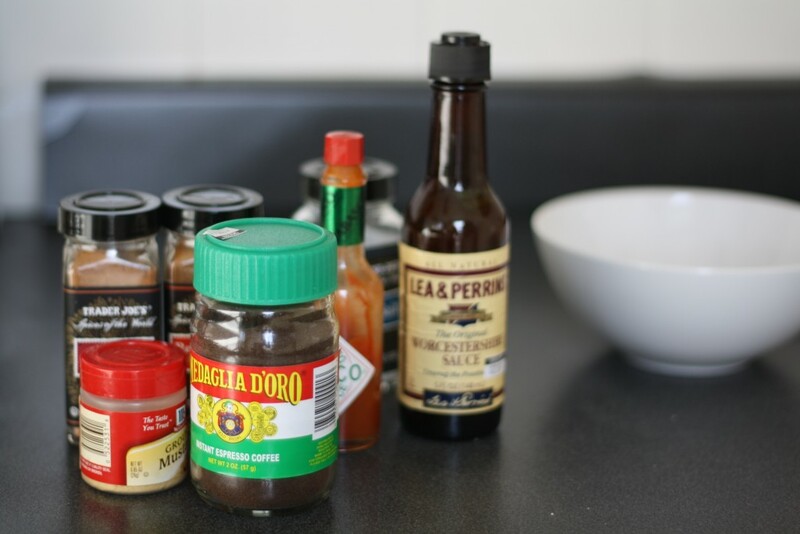 However if you tend to gravitate towards things on the crazier side and like to go nuts* then I would double the amount of dry spices – minus salt – that go into the mix (i.e. double the sugar, cinnamon, espresso powder, cayenne and mustard) as listed above. *Pardon the pun but I couldn’t resist. Wow, such a great idea! Thank you for sharing! Espresso powder, eh? And here I was just adding alcohol to everything! I’d say adding alcohol to everything works just as well! wow thanks for posting this. i would try this and give it to my mother. These look so delicious! I’m afraid I would eat them all before I could give them away. I know from experience this is true. I’m making a triple batch next time!! I love the idea of these being savory. I think it is so nice to have something you can make way ahead of time ready for munching whenever expected or the occasional unexpected guests arrive on your doorstep around the holidays. These look yummy! 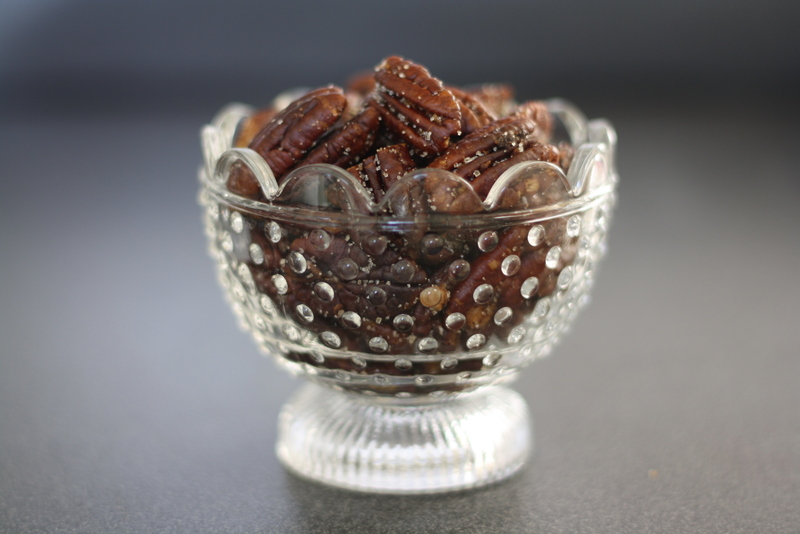 It also helps that pecans happen to be my favorite nut, AND that dish is way too cute! Thanks for sharing this! Thank you! I think its time for me to come clean – that dish is actually a candleholder from Ikea!! 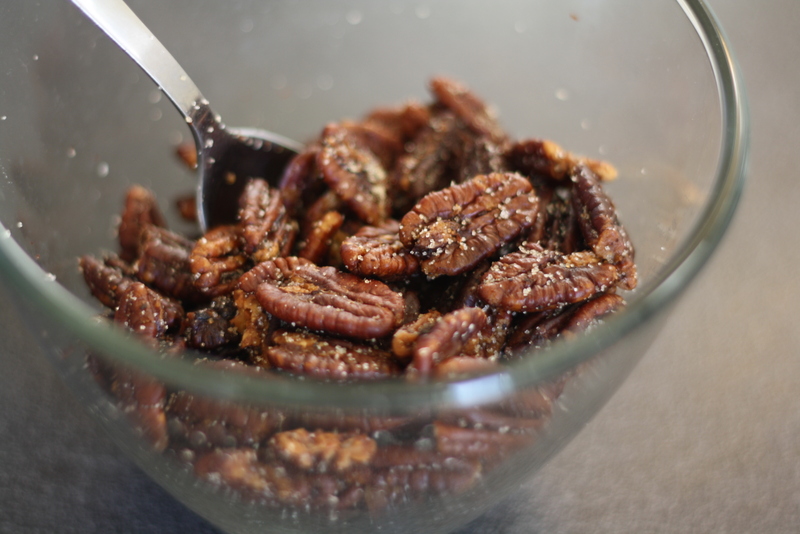 Yummy spiced nuts like this are exactly why I love the holidays so much! Yum! Isn’t the Pecan nature’s perfect nut! The pie’s, the extravagance, the spice. You’ve done a tremendous job exploiting the inherent capabilities of this royal nut. I’d like to add though an alternative. Coconut Oil and Maple Syrup sautéed Pecan’s. From here, get creative with the spices. Since it is a merry season indeed, I lean towards Cinnamon, Cardamom, a dash of fresh Nutmeg, and like yourself a pinch of Cayenne for Zazz! I’m a Coconut Oil fanboy, so I tend to abuse it, but with Pecan’s, I think it matched like a bunt and a cake! Great Blog and thanks for the tip. Oh, this looks and sounds as delicious as I imagine it will taste! Thanks. You cold really kick-it-up with some Ghost Pepper powder, available through spice distributors. Be careful however, Ghost Peppers are really hot! Yes, one of the hottest peppers in the world! I bet a pinch would be great!